'In Hoc Signo Vinces' (Latin: In this sign conquer) is Swedish metal band VII Gates second full length release coming four years after their well received 'Fire, Walk With Me.' VII Gates has built their sound on upon some very fundamental elements: classic melodic metal and hard rock. To this they have added doses of current power metal trends and, if I might add, a more than subtle dash of progressive elements. 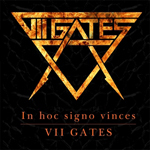 VII Gates blends this material quite well with impressive musicianship and fine song composition allowing 'In Hoc Signo Vinces' to be a diverse and entertaining mixture of music. VII Gates does better when they follow the aforementioned formula. Some progressive signs arise on numbers like 'Dreams, They Haunt Me' and 'Immortal Hymn To The Prison Guard' where they deliver quintessential classic metal in a focused, but not overbearing, power metal wrapper. Other times the melodic metal is generally straight forward yet with enough clever movements to keep you guessing and intrigued as on 'Skyrider,' 'The Mad Minstrels,' or 'The Lake.' The latter has an epic quality that progresses nicely with strong contributions from every member. For some atypical melodic hard rock and metal look to the last two numbers. 'Cat's Eyes' has signature upbeat rock and roll style showing VII Gates creativity. 'Feeding The Predator' pleases with an arrangement founded upon some great bass work. Where VII Gates stumbles is when the fundamental melodic rock or metal becomes generic as on 'Answer To You, Heart' or 'Children Of The Corn.' Additionally, when vocalist Criss Blackburn over extends himself his vocals become both unintelligible and annoying, piercing your ears like fingernails on a chalkboard. Otherwise, when he's within his range, he's pretty amazing. Frankly, I was a little leery of listening to VII Gates' 'In Hoc Signo Vinces.' Another heavy/power metal band from Sweden is hardly new. But on this work VII Gates proves they have the talent and creativity to do more than pummel us with more Scandi power metal. This a solid and entertaining accomplishment.